St. Gevorg Church also referred to as Saint Gevork Monastery is known for its early medieval Armenian architecture and was constructed so as to house a few remains of Saint George who was popularly referred to as the "Slayer of Dragons". The Church stands within the monastery which is rectangularly walled and a cylindrical drum that is notable for its horizontal alternating striped pattern and a conical dome above. The St. Gevorg Church is distinguished from other similar structures by its distinct construction solutions the exemplary architecture. The drive up to the Church is a delightful one and as soon as you enter the Church, you can feel a positive energy. Do visit this 17th century, well-preserved Church to admire the architectural brilliance. Beautiful church and I love the driver who drove me to the church for free even though I did not waved and stopped his car !! Nice place but not a lot of things to see. 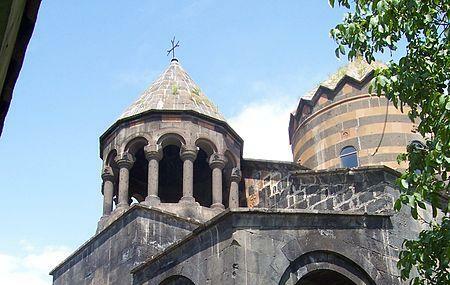 Saint Gevorg is a huge church situated in Mughni village. It is very easy to get there from Yerevan. It is named after Saint George (Георгий Победоносец). You can see lavish ornaments on the church's facade, many images, one of them depicting Saint George and the Dragon.